Connect Tableau to Salesforce® in the same interface you use for spreadsheets, databases, cloud data, & Hadoop. Create custom sales dashboards in minutes with no programming, and access them from any browser or tablet. Blend cloud data with sales quotas, demographics, market sizing, and more. Shift between different views of data, add maps, and enhance with table calculations for more insights. Use the automatic forecasting as a baseline to estimate progress toward making quota. Provide the right people with the right information at the right time Imagine you have a national team of sales executives, sales managers and sales reps who use Salesforce intensively to track their daily sales activities. Wouldn’t it be nice if you could offer a series of dashboards that would provide both at-a-glance insight and drill-down capabilities? 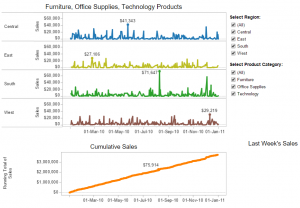 Developed by Tableau partner, Seahorce, this dashboard series shows it can be done. For sales executives, operational efficiency and financial results are obviously top priorities. 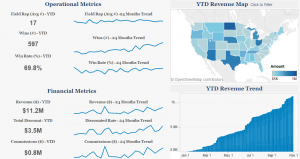 The executive overview dashboard provides a scan-friendly overview of key executive metrics such as number of reps, number of wins, win rates, revenue, sales discount, commissions, plus a YTD revenue map and a trend chart. For sales managers, the focus is the operational efficiency of their own team. Does the team have a short sales cycle? Do they have a higher win rate than other teams? Are they improving their wins per rep? Finally, you have the reps— your troops on the ground who really get the job done and bring in the numbers. How about creating a platform where they can measure their progress and see what is coming in and out of their pipelines? In addition, this dashboard can also help managers monitor individual performance and enable team members to compare their sales results. Stop waiting weeks for data Any software application can create a quota report. But how many allow a manager to create their own sales report, today? Tableau enables rapid creation of beautiful and accurate sales reports by any business user with no programming required. Tableau connects live to your sales data so you can update your reports to accommodate the latest orders as well as territory changes, personnel changes or business rules – how are we going to report on that new incentive bonus? See performance details by team or by salesperson with a quota performance dashboard. Here it is obvious that the Central region is underperforming. 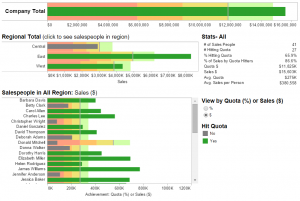 Drill down to the salespeople in that region, and you find that while many salespeople have already hit quota (the green bars), several more are far behind in the red region (gray bars). In this visualization each bar is a bullet chart: the shading in the background indicates the percentage attainment of quota. Less than 50% quota attainment is red. The green zone shows 100-125% quota. If any salesperson attains quota, the bar for that salesperson automatically turns green. With Tableau you can switch from quota attainment as a percentage or a dollar value with just a click. Understanding corporate sales performance is key to determining what adjustments you need to make to your business today. Typical comparative analysis, such as year over year growth, is easy to do as a single calculation. But you also need to look at your performance historically, cumulatively and for every slice of your business. 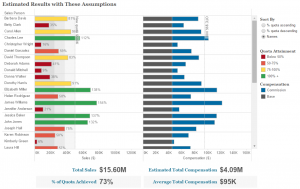 Tableau lets you assess sales performance from all these angles at once. Here we’re looking at sales trends by region and product. The daily sales trend for each region is shown in the top view, and the orange line below shows a running total of all sales. Filter to the region and products that you are responsible for and save that view. Tableau automatically updates when it’s connected live to data, so when you log in tomorrow you’ll see your updated sales data right in your saved view. Compare the current quarter’s weekly sales with previous weeks and quarters. This gives a perspective on the current situation using concrete numbers. The filters can be adjusted to see the impact of any line of business or region (call center) on the overall state of the business. 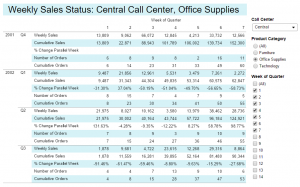 Weekly numbers show actual sales and orders, quarter to date sales and orders, and quarter over quarter growth. You can also set a fiscal calendar. With Tableau, you have sales reporting software that delivers what you need, at the speed of thought. A big part of managing sales is planning. How do you know whether you will meet your revenue goal? How much should you plan for compensation this quarter? How well are you rewarding top performers? What will happen if you change the sales plan? Using visualization and what-if sales analysis you can quickly walk through possible outcomes and manage your risk. This sales dashboard lets you model changes in compensation, quota and commission. Here you are modeling a new plan with a base salary of $40,000, a quota of $600,000 and a commission rate of 10.6%. You can see that 6 of 41 salespeople are projected to hit quota and your cost of sales is estimated to be 21.6%. For comparison, the actual numbers from last year are also presented in the lower right corner.